Yesterday was quite an adventure! 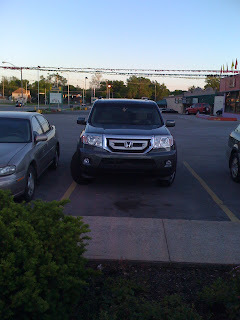 In the morning, DH (dear husband) planned to take a trip to the car dealer just to peek at three models of the Honda Pilot we were eyeing. He ended up purchasing a beautiful '09 Honda Pilot Touring!! It's gorgeous! I will miss my little manual Mazda 6 a bit, but this new SUV seats 8 with bells and whistles. Plenty of room for stroller AND groceries now!! Then, on a whim we decided to head up north to Ft. Wayne to see my Grandpa who is in the hospital. DH decided to come with and join the party. We met my Dad up there and visited my Grandparents for a while. 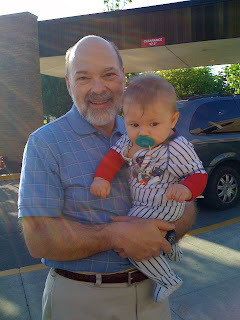 E. hanging out with Papaw! After the short trip, we decided to grab a bite on the way out of town. Should we go for the prime rib place, the mexican place with an Irish name (haha)...or...how about ATZ's!!! I guess Atz's was a big hit back when my dad was young, living in Ft. Wayne. Still is pretty popular. He actually had his 16th birthday party there! It's a diner type, ice cream shop well known for their Mad Anthony Sundae! We decided to give it a whirl (after confirming that there was real food and not just ice cream for dinner)! We all got the AtzBurger..of course. And then topped it off (probably a bit too much) with the Mad Anthony. 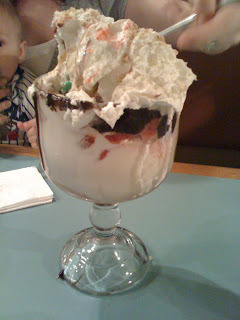 It had 4-5 different types of ice cream, 3 layers of topping (strawberries, pineapple, bananas, hot fudge, M&Ms, and on...and on). We had to bump up the cherry count to 3 though ;) We devoured it pretty well, even though it should have taken 5 people to eat the monster. There was some left...don't worry. All in all, we had a fun trip and I really enjoyed taking a trip back in time with Dad. It was fun to see and here about the different places he went to...like walking from school over to the bicycle shop where he worked...then to Atz's! We made it back safe and sound in our new Pilot. Unfortunately, E. decided to have a late night and finally konked out in bed with mom and dad around 12:30! We were all in bed by 1 AM. What a day! !